→ Innovation is actually a very simple phenomenon. Don't lose focus on the customer if you don't want to lose them and your business. "There is only one boss. The customer. And he can fire everybody in the company from the chairman on down, simply by spending his money somewhere else," said → Sam Walton. Sadly, mature companies often forget or forsake the thing that made them successful in the first place: a customer-centric business model. They lose focus on the customer and start focusing on the bottom line and quarterly results. They look for ways to cut costs or increase revenues, often at the expense of the customer. 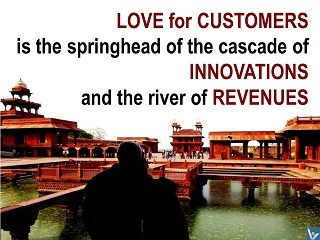 They forget that satisfying customer needs and continuous → value innovation is the only path to → sustainable growth. This creates opportunities for new, smaller companies to emulate and improve upon what made their bigger competitors successful in the first place and steal their customers. the aspirations of its customers. → customers, normal people's eyes.